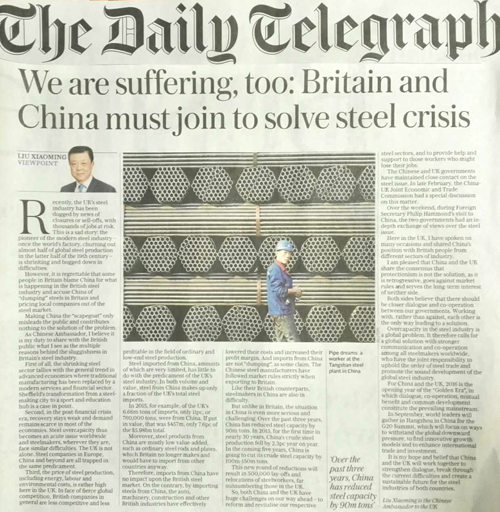 The Daily Telegraph Publishes A Signed Article by Ambassador Liu Xiaoming Entitled "We Are Suffering, Too:Britain and China Must Join to Solve Steel Crisis"
Recently, the UK's steel industry has been dogged by news of closures or sell-offs, with thousands of jobs at risk. This is a sad story: the pioneer of the modern steel industry – once the world's factory, churning out almost half of global steel production in the latter half of the 19th century – is shrinking and bogged down in difficulties. However, it is regrettable that some people in Britain blame China for what is happening in the British steel industry and accuse China of "dumping" steels in Britain and pricing local companies out of the steel market. Making China the "scapegoat" only misleads the public and contributes nothing to the solution of the problem. As Chinese Ambassador, I believe it is my duty to share with the British public what I see as the multiple reasons behind the sluggishness in Britain's steel industry. First of all, the shrinking steel sector tallies with the general trend in advanced economies where traditional manufacturing has been replaced by a modern services and financial sector. Sheffield's transformation from a steel-making city to a sport and education hub is a case in point. Second, in the post-financial crisis era, recovery stays weak and demand remains scarce in most of the economies. Steel overcapacity thus becomes an acute issue worldwide and steelmakers, wherever they are, face similar difficulties. The UK is not alone. Steel companies in Europe, China and beyond are all trapped in the same predicament. Third, the price of steel production, including energy, labour and environmental costs, is rather high here in the UK. In face of fierce global competition, British companies in general are less competitive and less profitable in the field of ordinary and low-end steel production. Steel imported from China, amounts of which are very limited, has little to do with the predicament of the UK's steel industry. In both volume and value, steel from China makes up only a fraction of the UK's total steel imports. In 2015, for example, of the UK's 6.66m tons of imports, only 11pc, or 760,000 tons, were from China. If put in value, that was $457m, only 7.6pc of the $5.98bn total. Moreover, steel products from China are mostly low value-added, such as ordinary steel rods and plates, which Britain no longer makes and would have to import from other countries anyway. Therefore, imports from China have no impact upon the British steel market. On the contrary, by importing steels from China, the auto, machinery, construction and other British industries have effectively lowered their costs and increased their profit margin. And imports from China are not "dumping", as some claim. The Chinese steel manufacturers have followed market rules strictly when exporting to Britain. Like their British counterparts, steelmakers in China are also in difficulty. But unlike in Britain, the situation in China is even more serious and challenging. Over the past three years, China has reduced steel capacity by 90m tons. In 2015, for the first time in nearly 30 years, China's crude steel production fell by 2.3pc year on year. In the coming five years, China is going to cut its crude steel capacity by 100m-150m tons. This new round of reductions will result in over one million lay-offs and relocations of steelworkers, far outnumbering those in the UK. So, both China and the UK have huge challenges on our way ahead – to reform and revitalise our respective steel sectors, and to provide help and support to those workers who might lose their jobs. The Chinese and UK governments have maintained close contact on the steel issue. In late February, the China-UK Joint Economic and Trade Commission had a special discussion on this matter. Over the weekend, during Foreign Secretary Philip Hammond's visit to China, the two governments had an in-depth exchange of views over the steel issue. Here in the UK, I have spoken on many occasions and shared China's position with British people from different sectors of industry. I am pleased that China and the UK share the consensus that protectionism is not the solution, as it is retrogressive, goes against market rules and serves the long-term interest of neither side. Both sides believe that there should be closer dialogue and co-operation between our governments. Working with, rather than against, each other is the only way leading to a solution. Overcapacity in the steel industry is a global problem. It therefore calls for a global solution with stronger communication and co-operation among all steelmakers worldwide, who have the joint responsibility to uphold the order of steel trade and promote the sound development of the global steel industry. For China and the UK, 2016 is the opening year of the "Golden Era", in which dialogue, co-operation, mutual benefit and common development constitute the prevailing mainstream. In September, world leaders will gather in Hangzhou in China for the G20 Summit, which will focus on ways to withstand the global downward pressure, to find innovative growth models and to enhance international trade and investment. It is my hope and belief that China and the UK will work together to strengthen dialogue, break through the current difficulties and create a sustainable future for the steel industries of both countries.